(17/P29) TRENTON – Some 112,500 free tree seedlings will be available to state residents in 128 municipalities through an ongoing partnership among the New Jersey Tree Recovery Campaign, State Forest Service and the non-profit Arbor Day Foundation Commissioner Bob Martin announced today. Municipalities that registered in February for the seedlings will receive up to 2,000 trees each for distribution to residents at designated locations, listed at www.forestry.nj.gov. Residents are eligible to receive up to five free seedlings at any distribution site. Proof of residency in the community where seedlings are distributed is not required. This is the fourth year for the effort, which was launched to help communities after Superstorm Sandy destroyed thousands of trees in October 2012 as result of strong winds and record storm surges. Including this year, the program has distributed 459,500 tree seedlings since 2014. 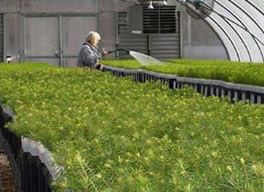 The New Jersey State Forest Service will deliver the seedlings to 13 regional distribution centers for pick-up by those municipalities, which will then distribute them to residents through May 7. Each participating community will distribute seedlings on a designated date. The State Forest Nursery in Jackson grows 500,000 trees annually, helping to protect, preserve and promote native species such as the eastern red cedar, sycamore, and the northern red oak, which is New Jersey’s official state tree. The nursery sells the majority of trees in packets of 100 to non-profit organizations and landowners who use the trees to reforest their land. Packet prices start at $30. The nursery also offers the Third Grade Tree Team program, which provides third graders across the state with a free tree seedling when requested by schools. For Arbor Day celebrations, the nursery offers 98 tube seedlings for $25. For more information on these programs, visit: www.forestnursery.org or call (732) 928-0029. The New Jersey Tree Recovery Campaign is a joint public-private effort between the New Jersey State Forest Service’s Community Forestry Program and State Forest Nursery, New Jersey Soil Conservation Districts, Sustainable Jersey, Arbor Day Foundation, Brothers International, BJ’s Wholesale Club, Wyndham Vacation Resorts and FedEx. Arbor Day Foundation’s Community Tree Recovery, a national program underwritten by FedEx and foundation members, aims to replace trees in communities affected by natural disasters throughout the United States. The program assisted more than 200 communities in planting or distributing more than 3.8 million trees since its inception in 2012. This year in New Jersey, the foundation expects to distribute and plant up to 85,000 new trees.